A Clockwork Brain developer Total Eclipse has released its newest title on iOS: Monster Snack. The endless-runner-meets-color-puzzle game sees users helping crocodile Monsieur LeCroque escape from a massive fish by tapping on the screen to give his rocket more fuel. The single-tap experience offers an increasing level of difficulty in each game, depending on how long players last before eventually being swallowed by the fish. 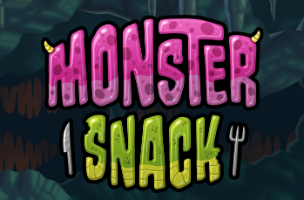 In each game of Monster Snack, players tap on the screen when hovering above or below colored crystals to shoot them. These crystals give the ship more fuel to move, but they can only be destroyed if the ship is currently glowing in that same color. A window on the side of the ship shows the current required fuel color, as well as the color needed next for planning ahead. As players encounter larger groups of crystals, they’ll need to tap faster and faster on the screen. Miss a crystal and it’s game over, unless, that is, players have filled their boost bar with their great performance. This bar is filled by picking up power-ups in the path (this is done by swiping anywhere on the screen), or by lasting a long time in a single game. If players miss a crystal when the bar is filled, they’ll zoom forward on the screen and escape the fish for a second chance. Players can spend premium currency to keep playing after they’ve missed a crystal, which keeps their high score and maximum travel distance intact. Users can track their scores against others via Game Center, and an achievements list is coming soon. Monster Snack is available to download for free on iOS.